Wow, its been a full month since I’ve posted, I have no excuse, just been lazy. I’m pretty excited to write up this one ’cause I haven’t bought a new HDTV in a long long time. I bought my first HDTV in the summer of 2003 and have owned a total of three HDTVs. It’s very hard for me not to buy a new one every year, but luckily I have enough other desires to keep me busy. At CES 07, the second I saw the Pioneer 8th generation plasma demo, I knew that was going to change. I just couldn’t get over how big of a step these new TVs were compared to anything I’d ever seen before. I had to wait almost 9 months to get one in my house, but on Friday I received my new 60″ 1080p PDP-6010FD Plasma from Plasma concepts. After some debate I ended up with a nice wall mount and a new piece of furniture to put my center channel on. Eventually there will be a full review on EngadgetHD, but for now, all I can say is WOW! This thing is really a sight to see and if you haven’t seen one yet, you have to make it to your local retailer and you’ll understand why the new Kuro line is the new standard in HDTVs. 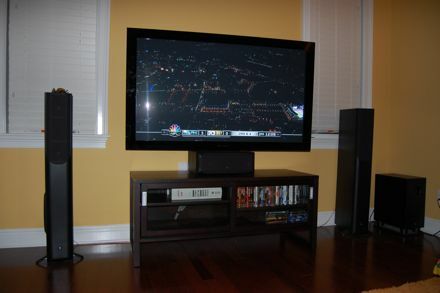 If you decide to buy one too, hook me up and buy the Pioneer KURO PDP-6010FD 60″ 1080p Plasma HDTV from Amazon.